To comfortably welcome your spectators and to guarantee everyone an optimum sight line, we provide a large range of grandstands, tiered seating and podiums: standard or progressive slope, corner grandstands, etc. GL event is the 1st player in the event industry to be certified conformed to ISO 9001 and ISO 20121 standards concerning grandstands installation for events. Major events usually gather many people and have an impact on the public that lasts. 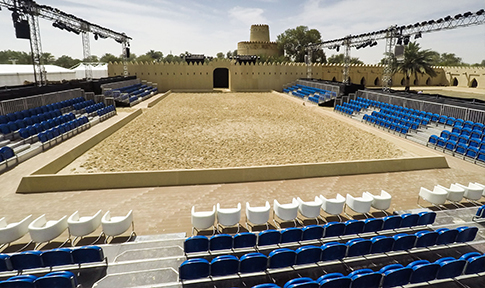 The first objective is to welcome the audience in the most comfortable way even if grandstands are usually installed on grounds which are difficult to access. The strong expertise of our teams will enable you to host your audience in the most comfortable way and guarantee them an excellent visibility wherever they seat. Cultural events are usually large-scale projects gathering professional, passionate people and amateurs. Those performances require considerable temporary infrastructures. 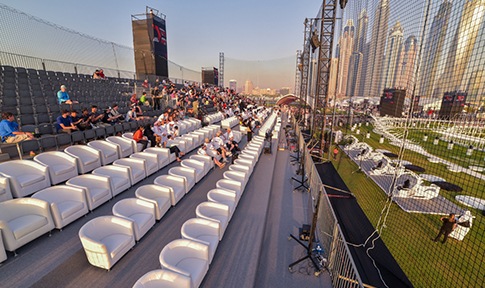 Specialised in event grandstands, our experts can equip the areas with a 360-degree-view so that the audience can fully enjoy the show. The objective is to comfortably welcome the audience (general public and VIP) providing them with a full view of the field. Thanks to our experts we provide you with grandstands’ study and layout in record time in accordance with the technical constraints of the indoor or outdoor place.